We all know that a business card is a “small card printed with one’s name, professional occupation, company position, business address, and other contact information” (Dictionary.com). However, in the professional world a business card is so much more than just a piece of paper with information on it. Your business card is a personal connection between your employees and key stakeholders, including potential clients, vendors, employees, and stockholders. There are people who say business cards are becoming irrelevant in this digital world, but business cards are more meaningful than ever because of the digital age we live and work in. Although convenient, swapping contact information electronically between you and a potential client is very impersonal. Networking is about making genuine connections, and the best way to make a connection with a key stakeholder is through direct eye contact and a handshake. Meeting someone in person shows that you are genuinely interested in them and their company, and handing them a professionally designed business card can provide a positive, lasting impression. Business cards are often the first impression a person receives regarding you and your organization. Creatively designed business cards fuel conversations further than the initial introductions and help build your brand image, whether your image is professional and high quality, colorful and fun, funky and edgy, or all of the above. If your card is visually appealing and masterfully designed with the most pertinent information, people will be more inclined to share the card with others and spread your brand story. Are your undergoing an overall brand re-design, considering a few changes on your business cards to better align them with your brand design, or designing for a new product/service line? 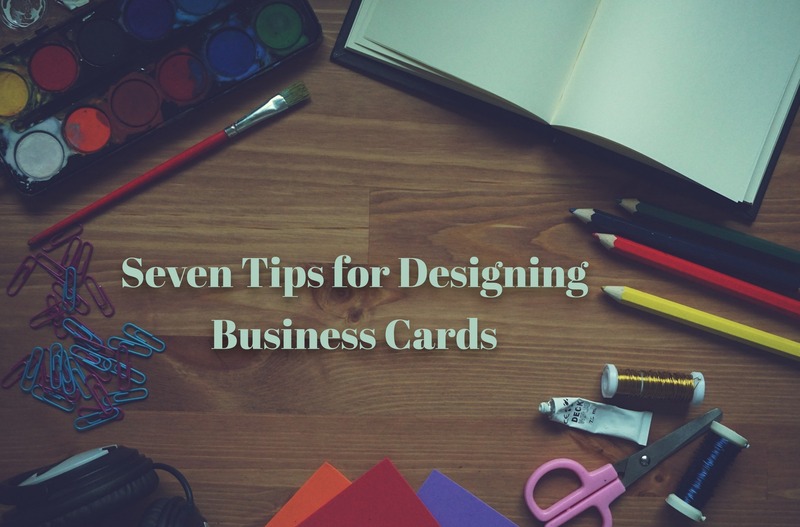 We have come up with seven tips to keep in mind when designing business cards. Similar to other marketing elements, consider who, what, when, and where. Which information is critical, nice to have, or not really needed? The area on the business card is relatively small, so make sure you give priority to the most important information needed by stakeholders to more effectively and efficiently transact business with you. Keep in mind that the business card must align with your overall brand design while also serving employees across the entire organization in various functional roles. Perhaps you have a core design for the front side of the business card, and supplemental information is printed on the back depending on departmental needs. This rule is probably the most important rule when it comes to not only your business card but also your brand. This rule specifically pertains to the size of your text. Smaller text often appears fuzzy and sometimes disappears on a dark background. Even if your contact information is legible on a computer screen, it does guarantee the card will print well. A general rule of thumb is to make sure your font is no smaller than 8 points. Font choice is crucial when designing for readability. In most instances, professional fonts are easier to read than calligraphy, which can be difficult to read despite the artistic appeal. Of course, the first consideration when it comes to color is that you want to ensure consistency with your company’s overall brand design and any applicable product/service brand design. You create brand identification when there is a clear visual connection between all elements of your marketing and sales support materials. There are two approaches people tend to take: the bold and bright colors or traditional design with little color. 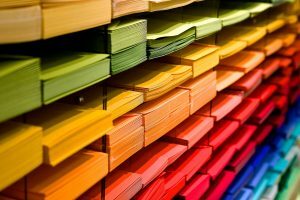 Bright and bold colors, if used correctly, can make your business card stand out among others, but it could also make your card stand out for the wrong reasons. The wrong color choices can make your card look tacky and cheap. If you plan to use bright colors pick complementary colors to ensure balance. Although simple and less colorful, the traditional design can be very striking and create a very professional and stylish look. If you think your card is too simple, there are other ways to make it stand out such as embossing. This tactic can make your card more engaging by triggering more than one sense. Instead of just engaging sight through printed text, embossing engages the sense of touch as well. Studies show that when more than one sense is engaged, your chance of remembering increases. Thicker card stock is often perceived as higher quality, more professional, and more durable. Most business cards end up in a wallet, purse, or business bag, resulting in a fair amount of wear and tear on the card. If you print on paper less than 300 gsm grams per square meter (gsm) or about 14 point stock, it will not only feel tacky and cheap, but it will also look tacky and cheap. By keeping your business card design simple, the information is more likely to connect with people and increase the probability of new projects. Although not as unique as some other medium, paper business cards are very accommodating and practical, allowing for customization at an affordable cost. And, they allow you to make a personal touch, such as writing a personal note on the card before giving it to a new prospect. Business cards provide an easy and direct way to make personal connections, further supporting your company brand and transforming contacts into clients, employees, vendors, or other key stakeholders. 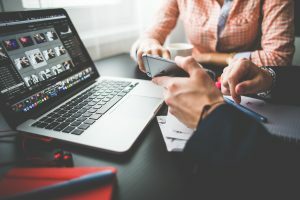 The personal connections you make are vital in client and vendor relations. Business card design is a key element in making a long-lasting first impression. What additional considerations regarding business card design would you add to the list? Please share below.